• The Millennium Bridge. 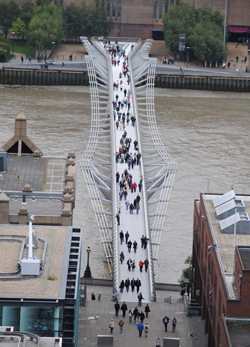 Initially nicknamed the “wobbly bridge” due to its propensity to move underfoot, this footbridge over the River Thames first opened in June, 2000, for only couple of days before it was closed for almost two years so its movement could be fixed and eventually reopened again in 2002. But despite its young age, the bridge has appeared not just in a Harry Potter film – 2009’s Harry Potter and the Half-Blood Prince – where it gets destroyed but also in the break-out 2014 Marvel film, Guardians of the Galaxy in which it plays the role of a bridge in the city of Xandar (embedded in the rest if the CGI-created city). Among other London locations featured in that film is the modern Lloyd’s Building in Lime Street (again, it makes part of Xandar). • The Regent’s Park. The 2010 film The King’s Speech features numerous London locations – among them is the Avenue Garden in the south-east corner of the park where speech therapist Lionel Logue (played by Geoffrey Rush) takes a stroll with Bertie, the future King George VI (played by Colin Firth), which turns a little uncomfortable. Other locations include 33 Portland Place (which plays the role of the Duke and Duchess’ Piccadilly home as well as that of the interior of Logue’s consulting rooms in the famous Harley Street), and the Draper’s Hall in the City, the interior of which plays the role of St James’s Palace. • The Temple Church. This famous – and beautiful – City of London church made its starring performance in the Tom Hanks movie of 2006, The Da Vinci Code. The church enters the movie when symbology professor Robert Langton (played by Hanks) and cryptologist Sophie Neveu (played by Audrey Tautou) come here in search for a knight’s tomb. Other London locations featured in the film (alongside those in France and Scotland), include Westminster Abbey (although the interiors were actually shot at Lincoln Cathedral). For more on the history of the church, see our earlier post here or on the tomb effigies, see our post here. Our next special series kicks of next Wednesday.